In the first story, Suchan goes to a Self Udong restaurant セルフうどん. From what I understand, it is a place where you can choose every ingredient that compose your udong, from the quantity of noodle, to toppings, condiments and seasonning. I gress that’s why Su asks for ワカメ, a seaweed, to add to her meal. 鍋をする・なべをする　eating together around a hot pot? 癒される・いやされる　This is an expression which means that, thanks to Something, you feel relieved from your stress, you feel at ease, at peace. You defenitely should search for 癒せる　in Google images and have a look at those cute little kitty faces! 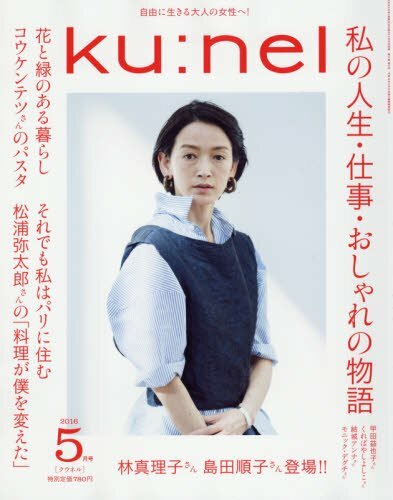 Suchan bought the magazine クウネル　ku:nel. I didn’t know when I first read this story, but the magazine really exists. It seems to deal with cooking, home and life style. I found this cover and I understand better what she means when she said that those people were living straight life and that they never seem to be hesitating… haha. 炊く・たく　to cook rice or beans. ださい means unsophisticated, out of fashion, the contrary of fancy. 座椅子・ざいす　is a chair with no legs, to seat on the floor. Now what’s this phrase supposed to mean… Does it mean that things look nice or attractive but that only half of it is real and that the other part is not at all what we expected… ? 東急ハンズ　Tokyu hands is a store where you can find almost everything for the house and daily life.